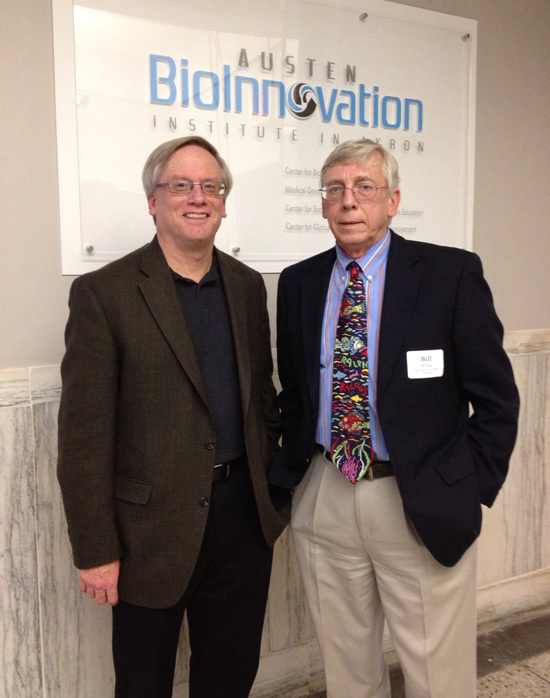 Bill White (right) shares a moment with Jim O’Hare, BioMedia, following a presentation on behalf of BioOhio at the Austen BioInnovation Institute, Akron, Tuesday, December 13, 2011. The seminar, co-sponsored by The Business Wire, Cleveland, and the Austen Institute, focused on marketing and communications programs for emerging growth companies. Along with White and O’Hare, panelists included Tim Baker and Erik Yorke of Baker and York. Founded in 1987 as the Edison BioTechnology Center (and formerly Omeris), BioOhio is a non-profit organization designed to build and accelerate bioscience industry, research, and education in Ohio. Offenberger & White, Inc. (OffWhite) is a member of and contributor to BioOhio programs that span Ohio’s life science industry and beyond.